We’ve been called a “toy store for grownups” and don’t argue with the name. But in addition to all of the great, fun gear we have for bicycling, hiking, paddling, etc., we also have Real Toys. We keep a good selection of Ultimate Frisbees, as well as some light-up Frisbees, Aerobie rings, and a staff favorite: woven flying discs called Pocket Discs from PhD Productions – a member of the Fair Trade Federation. 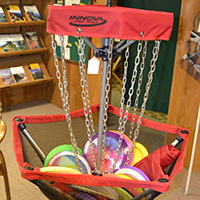 We also have golf discs, hammocks and webbing for your slackline. Disc Golf is a favorite local sport, and we have a huge selection discs from several favorite companies to help you put together a great bag of discs. And we have bags, too. If you have favorite brands or styles, and don’t see them on our shelves, ask us to order them! There are several good courses in the area, and we have maps to help you play, and the local club is very active so you can find other disc golf enthusiasts. 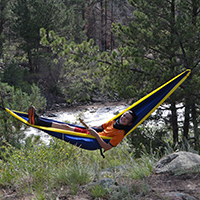 As hammocking has grown in popularity, so has the variety of hammocks we sell. We have both singles and doubles made from parachute nylon from two hammock companies, as well as lightweight nylon and ultralight options. For those looking for a hammock for backpacking, we have hammocks with built-in mosquito netting and with rain covers as well. And we carry several hammock hanging kits, as well as several types of cord, webbing and carabiners to make your own hanging kit. Dog lovers know that high quality dog gear can be hard to find. That’s why we carry two of the leading dog gear suppliers, with products made specifically for the outdoors. Dog packs, harnesses, and PFDs (life jackets) can make your time on the trail with Fido much more enjoyable for both of you. We also keep some great no-stink collars, bungee leashes, and packable bowls, along with other great dog gear. And we can order for you if you don’t see what you need.